and used bags of beans to barter? On a quiet winters day in 2017 the team at Heritage chocolates (Tower Mints sister company) were busy working away when the phone rang. On the other end of the line was the team at Hotel Chocolat who are a British company creating a revolution in the world of chocolate. 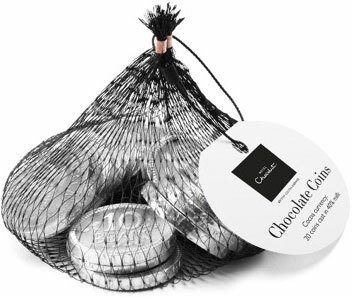 The Hotel Chocolat commercial team had a very special idea to create a bespoke chocolate coin made from their very own chocolate recipe. Within hours of the call the Heritage chocolate team sprang into action looking at the feasibility of such a request. Following an evaluation of supply chain, some creative thinking and the sharing of ideas the project was a go. 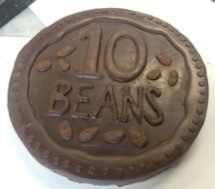 To give the chocolate coin an extra level of authenticity Raphael shared his sculpting experience with the Hotel Chocolat chocolatier Rhona who opted to sculpt the design from a pure block of chocolate. This model was then put through a scanning process (being careful not to melt the chocolate) to create a digital model. Heritage Chocolates were one of the first in this country to stamp coins with real prestige, from palaces to museums, and the only mint in the UK still working in chocolate today. The approved model was then cut into chocolate embossing dies, the presses were prepped and then the foil wrapped vision became alive. Once the chocolate coin was embossed the coins were netted, labeled and dispatched for sale in stores across the UK. PreviousPrevious post:BBC Royal Correspondent Jenny Bond Strikes a CoinNextNext post:Platinum Wedding Coin Reaches One Hundred Thousand Strikes.